When the World Warriors meet the Night Warriors, they’ll raise hell! Toronto, ON – January. 25, 2017 – The time-tested combatants of Street Fighter and Darkstalkers have met many times in the arcades, but nothing can prepare you for their first action-packed, fan service-fueled comic crossover! Villains will unite, friends will become foes, and the worlds of two fighting game franchises will be changed forever! This April, STREET FIGHTER VS. DARKSTALKERS #1 arrives, launching the 8-issue comic series with a bevy of unique and fun variant covers. 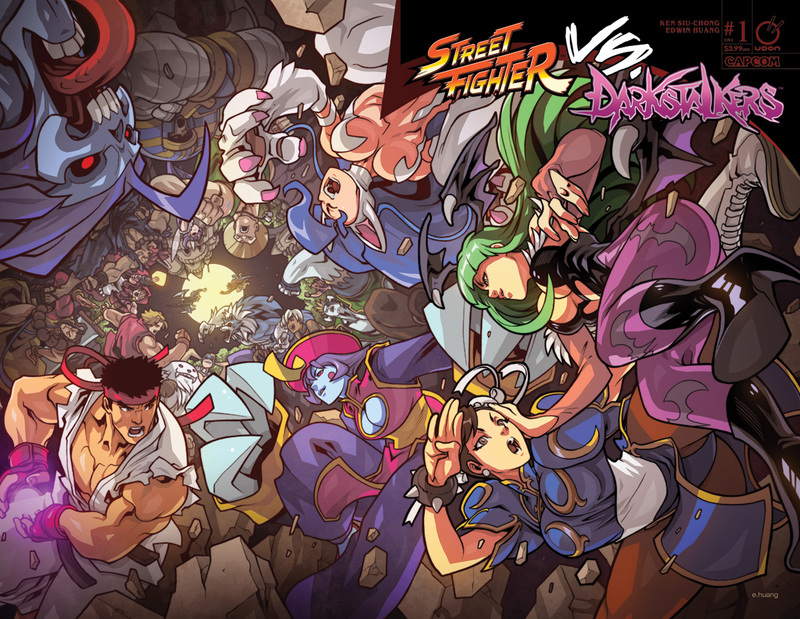 Street Fighter VS. Darkstalkers #1 sports two standard covers. Series artist Edwin Huang provides the Wraparound Story cover (CVR A). Rob “Robaato” Porter illustrates the Midnight Bliss cover (CVR B), which features an array of fighters who have succumbed to Demitri’s gender-swapping power – in fact, issue #1-4’s CVR B will connect to form one massive four-part Midnight Bliss image! Also available for Street Fighter VS. Darkstalkers #1 is a special Blank Sketch cover (CVR C) and two retailer incentive covers. The Movie Poster incentive cover (CVR D) by Joe Vriens pays tribute to a classic horror movie poster, while popular cover artist Stanley “Artgerm” Lau provides a Guest Artist incentive cover (CVR E) showcasing leading ladies Chun-Li and Morrigan. UDON has also teamed up with some righteous retailers to produce epic retailer-exclusive variants! Focus Attack, the top-tier arcade parts e-commerce shop, will be selling an exclusive wraparound cover by Jeffrey “Chamba” Cruz, that pays homage to a classic Capcom Secret File cover. It will be available in both full color and black-and-white line art versions at focusattack.com. Meanwhile, Fried Pie Comics will be selling their own Street Fighter VS. Darkstalkers #1 exclusive cover by Jean-Baptiste Nanteau. This cover connects with Fried Pie’s exclusive cover for Street Fighter VS. Darkstalkers #0 to form a terrifying two-part image! Fried Pie variant covers are available through Books-A-Million and 2nd & Charles stores. Street Fighter VS. Darkstalkers #1 hits stores everywhere in April 2017, preceded by a special prelude issue, Street Fighter VS. Darkstalkers #0, in February 2017. Every issue of Street Fighter VS. Darkstalkers will also be made available digitally via comiXology. Media inquiries and/or requests for review copies should be directed to Jenny Myung at press@udonentertainment.com.